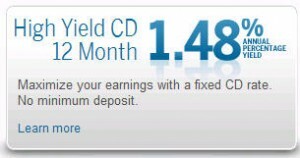 Ally Bank CD rates (certificate of deposit rates) are among the best cd rates in the nation. You probably remember Ally Bank under a different name – the General Motors Acceptance Corporation, or GMAC. Founded 90 years ago, it’s still going strong offering great financial deals to consumers, though of course it has changed its name. The CDs from Ally are FDIC insured like any other bank, and there are no minimums so you can open an account with no money down. There are no monthly fees, and you get a special “Ten Day Best Rate Guarantee”: When you fund your CD within ten days of opening or renewing your Ally account, you automatically get the best rate Ally Bank offers during that time period. Ally compounds interest daily for a higher rate while many banks compound monthly. Its California Ally Bank CD rates generally beat those of big banks such as ING Direct, Wells Fargo, Chase, Bank of America though of course the standings change over time. Rates change over time, of course. For savings, consider an Ally Bank certificate of deposit to lock in a good CD rate. Among the best cd rates in the nation, you’ll usually find Ally Bank CD rates in the tier of the national top ten, or even top 5 interest rate champs for consumers.